Cape Town – Leading South African event company espAfrika revealed the first 13 confirmed acts which will form part of the star-studded line up for next year’s 14th Cape Town International Jazz Festival (CTIJF) which will take place on Friday 5th and Saturday 6th April 2013 at the Cape Town International Convention Centre. For the first time ever at the CTIJF audiences will be able to experience the world-famous Buena Vista Social Club featuring Omara Portuondo (Cuba). A celebration of traditional Cuban music popularized in the members club with the same name in Havana, Buena Vista Social Club became an international success thanks to a widely acclaimed studio album release in 1997 and an Academy Award nominated documentary which captured their two live performances released in 1999. Renowned bassist, composer, singer, arranger and producer Victor Ntoni (SA) headlines the list of premier South African acts that will perform at the festival. Bra Vic (as he is widely known) is a musician of note on the South African music scene. At this year’s festival Ntoni presents Iconoclast, featuring Khaya Mahlangu, Lawrence Matshiza, Lungile (Lulu) Maduna and Hilton Schilder. Renowned artists Jack DeJohnette, Ravi Coltrane and Matt Garrison will come together at the CTIJF as part of a groundbreaking Jack Dejohnette Trio (USA). Ravi, Jack and Matt (USA) is a reunion 20 years in the making and is a celebration of an original event at the Brooklyn Museum in New York. The trio celebrated the music of the great John Coltrane then and today their collaboration explores open improvisation as well as their own compositions. Acid funk jazz group the Brand New Heavies (UK) will provide some nostalgia at the CTIJF with hits like Never Stop, Dream Come True and You are the Universe. Jazz aficionados will also welcome the news that South African singer Jimmy Dludlu will be on the 2013 bill. Dludlu is a self-taught acclaimed guitarist, arranger, band leader and singer, known internationally for his original African jazz and fusion music. Pianist Robert Glasper Experiment (USA) continues to make waves throughout the music world as leader of both the acoustic Robert Glasper Trio (Chris Dave on drums and Vicente Archer on bass) and the Robert Glasper Experiment, in which he explores fusions of jazz and hip hop. The Experiment blends funky jazz with electric hip-hop beats, and is comprised of internationally acclaimed cross-genre masters - drummer Chris Dave, bassist Derrick Hodge and saxophonist/vocalist Casey Benjamin. Errol Dyers (SA) will bring his unique cross between the traditional langarm and the Cape Town carnival sound to audience at the CTIJF. The Cape Town jazz guitarist is highly respected as a pioneer of what has today become known as Cape Jazz-Ghoema. His performance will present audiences with a journey through Cape music styles and heritage, using words and music ranging from Moppies, Liedjies, Goema, Mbaqanga and Cape Jazz. This 7-piece band, with a rhythm section and brass, will feature some of SA’s most established and up-and-coming youth. The Reza Khota Quartet (SA) will return to the CTIJF in 2013. Led by vocalist and guitarist Reza the quartet also features Shane Cooper on bass, Buddy Wells on sax and Jonno Sweetman on drums. Latin jazz pianist Chano Dominguez (Spain) will be another treat for serious jazz lovers. Dominguez makes post-bop, fusion, and flamenco influenced music that often references his Andalusian roots. His most recent album Flamenco Sketches was released by Blue Note Records in March 2012 and features his signature style re-interpretation of Miles Davis "Kind of Blue". The album earned him many accolades from the press with the New York Times calling the album “A cultural re-imagining of “Kind of Blue”, and Wall Street Journal stating “Chano Dominguez is playing these melodies with more beauty and imagination than virtually anyone since Miles Davis & Bill Evans”. Dominguez will be joined by Blas Cordoba on vocals and percussion, Ben Street on bass and Dafnis Prieto on drums. Soul singer Zonke Dikana (SA) has established herself as a heavyweight on the music scene, easily capable of ascending local radio charts with both her songwriting and solo work. Audiences interested in South Africa’s urban sound will be able to see soulful house three-piece Mi Casa as well as Hip-Hop duo Khuli Chana and AKA. Mi Casa’s hits Heavenly Sent and These Streets off their self-titled album has enjoyed major airplay on South African radio. Khuli Chana is practiced in vernacular rap, Motswako, and earned huge success in 2010 for his Tswak Sticke'm, while AKA, real name Kieran Forbes, made waves on the local scene for his hits Mistakes and Do It. Together, they are fast becoming known for a slick and distinctively South African urban sound. Jazz vocalist, songwriter and actor Gregory Porter (USA) rounds off the initial list of artists that will form part of the 2013 CTIJF. Porter’s 2010 debut album Water was nominated for Best Jazz Vocal Album at the 53rd annual Grammy Awards. “We are delighted with this line-up. Once again we have been able to secure world-class international acts as well as the cream of our local talent. There is something for everyone from lovers of traditional jazz to younger audiences looking to hear more mainstream, popular music. Festival goers will not be disappointed,” says Rashid Lombard, festival director and CEO of espAfrika. Patricia De Lille, Executive Mayor of Cape Town echoes this sentiment. "This musical celebration epitomises what this administration aims to do in building an inclusive city by bringing together people from diverse backgrounds throughout the city and the rest of the country to enjoy the musical talents of local artists and renowned international superstars. The City will continue to support this festival, to promote the heritage of jazz music and ensure that it continues to attract large crowds." Now in its 14th year the Cape Town International Jazz Festival has grown into an important part of South Africa’s cultural landscape serving both as a draw card for major international acts and as a platform for local talent. The festival is also a highly respected global event on the international live music festival calendar. Lombard says organisers are delighted with the continued support the festival receives. “Every year we are delighted by the turnout in terms of the number of festival goers who attend the event. We are seeing more and more international visitors and members of the media coming to Cape Town – further indication that the festival now enjoys a global profile,” says Lombard. Tickets for this year’s event will go on sale on Saturday, 1 December, and will be available for purchase at Computicket outlets, Shoprite Checker’s outlets and via the Computicket website. The ticket prices are as follows: day passes: R440, weekend passes: R645 and Rosies Stage tickets are R30 (per performance). “We have managed to avoid significant ticket price increases for the past few years, however this year we have had to apply an increase to keep up with the times. Inflation, travel costs and a general increase in the cost of services across the board are all factors in this decision. We do however still believe that our ticket prices offer great value, especially when compared with other events which feature high profile international artists,” Lombard says. A major component of the festival, which has grown in size and stature over the years, and has been consistently applauded by the City of Cape Town and the Department of Arts and Culture, is the festival’s Training and Development Programme. The festival proudly presents a series of workshops that take place at various venues throughout the CBD and greater Cape Town area over an 8 day period. This social investment component explores various elements of the jazz world and includes Arts Journalism Workshops, as well as Music and Photographic Workshops, Music Business Classes, and Master Classes. 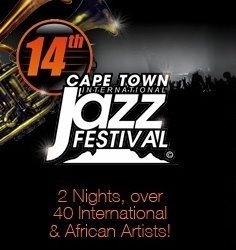 The official sponsors for the Cape Town International Jazz Festival 2013 are the Department of Arts and Culture and the SABC (the broadcast sponsor). “The SABC acknowledges with a deep sense of appreciation, the immense value the Cape Town International Jazz Festival has added to the development of the Industry – not only over the Festival weekend, but also by means of the master classes and workshops in the week leading up to the Cape Town International Jazz Festival. SABC has been instrumental in the success of the Cape Town International Jazz Festival, since its inception in 2000 and has therefore committed to deepen its partnership with this sought after Industry event. The objective then was to support Arts and Culture and for the National Public Broadcaster to take its place alongside Government, NGOs and other Corporates to play a meaningful role in developmental issues. That objective is as pertinent now, as it was back then. The SABC looks forward to its partnership with the Cape Town International Jazz Festival 2013.” says the SABC’s Spokesperson, Kaizer Kganyago. Rosies (stage 5) an extra fee of TBA an act gets you into the Rosies stage, which usually features the more serious jazz acts. Prohibited: Alcohol, weapons, glass, cameras, picnic baskets, chairs and sharp objects.